This season, it’s been too easy to be frustrated with Insecure’s characters. Watching the show feels like catching up with friends in that group text you’ve muted: Aren’t they always making the same ol’ mistakes? Molly is curving a guy she likes for a guy she just wants to sleep with; Issa keeps revisiting dead-end relationships; Tiffany has something snide to say; and Kelli, the friend who once told a white a guy he “looks just like Twilight,” will see you through until the surprise Due North finale. Luckily, Insecure’s season-two finale brought back a sleeper power player: Molly’s therapist, and, more importantly, Molly’s therapist’s office. Molly had a handful of much-needed therapy sessions this season, and they were some of Yvonne Orji’s strongest scenes. Maybe you missed them because you’re one of the people we pray for (#LawrenceHive), one of those we don’t talk to (#DanielHive), or perhaps you watch watch Molly’s therapy scenes as I do: like a horror movie, through my Dorito-dusted fingers, because Molly’s therapist doles out advice I should really be taking myself. But it’s all worth it for that glorious office. 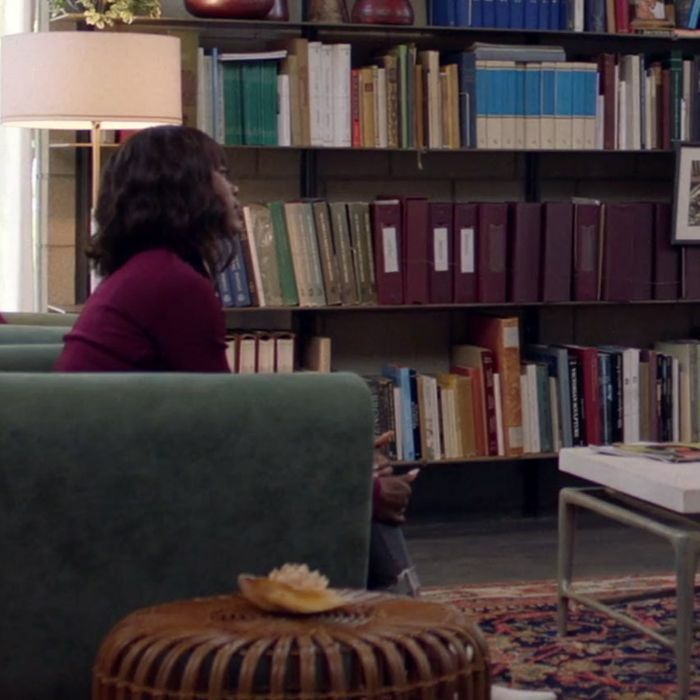 Molly’s therapist’s office makes a Nancy Meyers interior — like Meryl Streep’s It’s Complicated kitchen or Diane Keaton’s Something’s Gotta Give beach house — look like a gaudy CW set. With its ornate rug and bookcase stacked with hardcovers, this office makes the million-dollar homes on Big Little Lies look like a TJ Maxx stockroom that just happens to have floor-to-ceiling windows. There’s a fireplace in this office in a shade of mustard that can only be described as Mahershala Ali yellow. The focal point is that massive bookcase, which is stuffed with books and art and detritus of a fascinating life. Does she have a Toni Morrison first edition and a signed copy of Carrie Mae Weems: Kitchen Table Series? (I’m just guessing here, but I’m also certain I’m correct.) Is that a pencil sketch of Nina Simone? There’s a sculpture of black Jesus in the window, looking over us all. And the vases! Those vases deserve to be pronounced the pretentious way, like when “vase” rhyme with “bras,” because I’ll be damned if you enter Molly’s therapist’s office without any kind of home training. Who’s responsible for this bohemian sanctum? Insecure doesn’t tell us a lot about Molly’s therapist. We know she’s a shrewd listener, and she quickly identifies Molly’s obsession with worrying that her life doesn’t match some glitzy ideal. She’s wearing loose heather-gray knit set in the scene, along with a statement necklace. (Is it Nordstrom? As this summer’s leading comedy Girls Trip can attest, black aunties love Nordstrom.) Molly’s therapist seems like the kind of woman who keeps Patti LaBelle CDs in her car, and has a handful of church lady peppermint candies in her purse because you never know when you need one. But most importantly, finding a good therapist is difficult. With its high ceilings and trinkets, this office seems like a visual marker of the potential in Molly’s life if she’d stop revisiting her toxic relationship with Dro. It is stunning and big and bright: It’s no accident we see this haphazardly beautiful space through the eyes of the Insecure character who fixates on planning her way to a perfect future. On Blue Ivy Carter’s 4:44 freestyle, the tot said she’s “never seen a ceiling in [her] whole life.” Molly’s therapist’s bookcase, with shelves piled sky high, has that same flutter of possibility: It’s the closest most of us will ever get to Blue Ivy’s mantra. Anything could happen in this refuge, even Molly finally getting her act together.